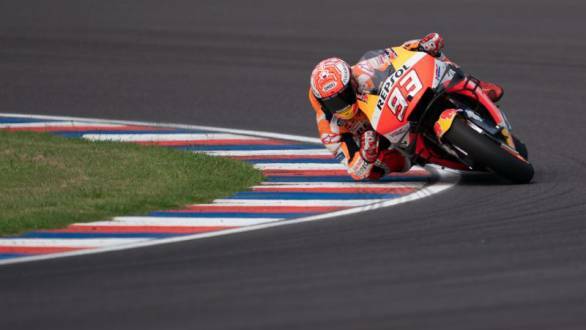 Repsol Honda's Marc Marquez took a dominant victory in Argentina, crossing the chequered flag over nine seconds ahead of his nearest rivals during the race. Second place in the race went to Valentino Rossi, who got the better of Andrea Dovizioso, with the Ducati rider having to settle for the final step of the podium. Marquez led the race from pole, and didn't really come under a serious threat from anyone, having a relatively untroubled run to the end of the race. The real battle was behind him, with Rossi and Dovizioso fighting hard for second. Early on in the race, the battle for second was waged by a number of riders, with it finally coming down to the Yamaha vs the Ducati. Dovizioso, who appears to be the master of the last lap surge (remember Qatar? ), wasn't able to outwit Rossi. The Italian MotoGP legend managed to move into the inside at Turn 7, eventually getting clear of Dovi, and moving into second. The loss of second place made a huge difference to Dovizioso, whose third-place finish meant that he lost the championship lead to Marquez. Jack Miller, astride the Pramac Ducati, was best of the rest, finishing fourth. Fifth place went to Suzuki's Alex Runs, who recovered well from his 16th-place qualifying position. Sixth place went to Danilo Petrucci, who benefited from the last lap disaster that saw Franco Morbidelli and Maverick Vinales come crashing down. Seventh place went to Fabio Quartararo, while Takaaki Nakagami took eighth place. Aleix Espargaro finished ninth, while Pol Espargaro finished tenth for Red Bull KTM. Tech 3's Miguel Oliveira finished eleventh. 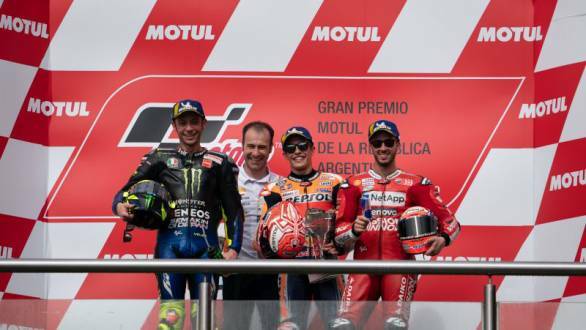 Twelfth place went to Repsol Honda's Jorge Lorenzo, who recovered from an early race disaster, while Cal Crutchlow finished 13th. Francesco Bagnaia and Johann Zarco rounded off the top 15.